Sheath custom fitted, border tooled and stiched. Belt loop will accomodate a 3 inch wide belt. Choice of dye color ..........Price: $50. 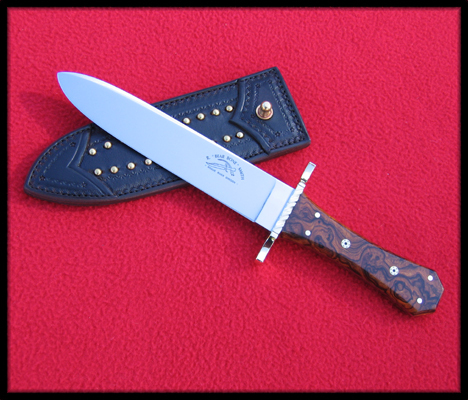 Custom Southwest double loop style sheath with border tooling and stamped design. Choice of dye color. Sheath will accomodate a 3 1/2 inch wide gun belt ..........Price: $75. Custom Southwest double loop style sheath with distinctive hand tooled patterns, silver conchos, silver spots and hand rubbed finish. Choice of dye color. Sheath will accomodate a 3 1/2 inch gun belt. (conchos and tooled patterns may vary based on the maker's artistic sense) ..........Price: $120. 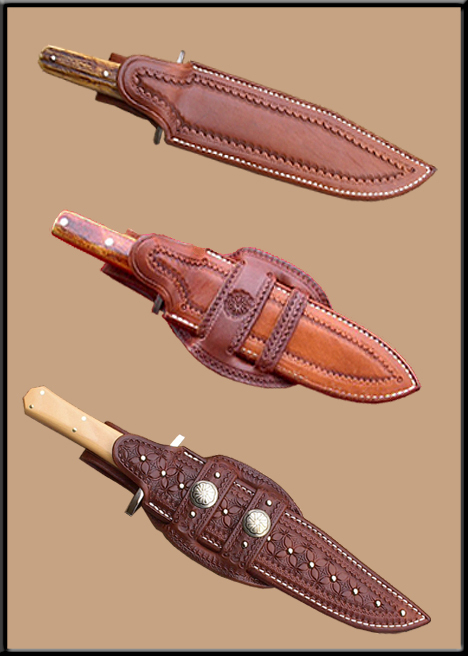 Classic, Inside-the-belt fancy leather sheath with belt stop toggle .............Price: $90.